There is probably no bigger question – at least for me anyway – when I plan for a race than, “where am I going to stay.” I like somewhere that is generally quiet (not the host hotel), has access to good training close by, is reasonably proximate to the race site, and has a kitchen. When Jill and Quentin come to races, it’s also nice if we can get a suite, so that we can put Quentin in a room and close the door when he naps, and then swap him into the “main room” when we actually sleep. We’ve made do with concessions across the board, but generally, I’ve always been able to find a place that fits the bill. Sometimes – almost always – it costs a bit more, but it’s always seemed like a “pound-wise” (rather than “penny-wise”) decision. 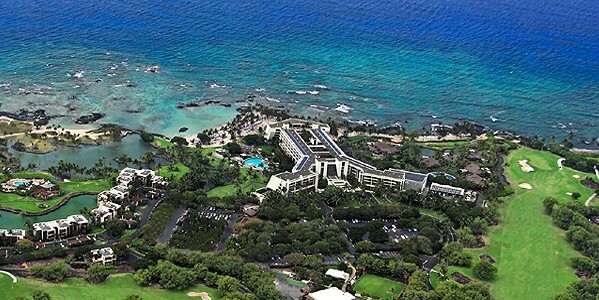 Kona presented a unique challenge, because none of the typical chains I rely on – Residence Inn or Towne Place Suites or the like – that guarantee suite-rooms with kitchens exist on Hawaii. Or, if they do, they are confined to the bigger cities. People on vacation – why most people go to Hawaii – don’t seem to care as much about being able to cook their own food as they do about having a really nice beach or access to a golf course. Hawaii is a vacation destination much more than a place people go for work trips. But since racing is my job, I actually like places – Phoenix or Henderson or The Woodlands – that are designed for work trips. Thankfully I’ve got some great friends in the sport that think the same way I do. Matt and Chris Lieto, and Linsey Corbin all stay the same place when they go to Kona, whether it’s for training or for the race. Chris actually lives there now, so he lives at home, but before he did, he stayed the same place. So relying on their expertise and vetting – and thankfully a huge showing of kindess from the Mauna Lani itself – I ticked all the boxes on my list in fine fashion. What other hotel do you know of that has its own awesome beach for swimming and a real lap pool for swimming? And has suite rooms with kitchens? And is out of the hubbub? And… Well, you get the idea. I’m incredibly excited to announce that the Mauna Lani Bay Hotel & Bungalows will be my home away from home for my first race at the Ironman World Championships. I was honored that they were willing to pair up with a first-timer at Kona and to help me take care of such a big logistical challenge. Anyway, I hope to see some of you there for the race. And I hope that I can expand my Hawaiian beyond the simple “aloha” and “mahalo,” though I think “mahalo” is certainly the appropriate thing to say to the folks at Mauna Lani!